In Buddhist and Taoist tradition, the fifteenth day of the seventh month in the lunar calendar is called Ghost Day, when the spirits of the dead return to earth. During their long journey, the spirits grow hungry, so the families of the dead prepare great feasts during the festival. They even leave an empty chair at the table for the ghosts. Intrinsic in the celebration is the tradition of ancestor worship. This involves ritualistic food offerings, burning incense, and floating paper lanterns on water. If the spirits are pleased by these offerings, then good fortune will come to the living. The Hungry Ghosts Festival is celebrated in many parts of the Far East, including China, Taiwan, Singapore, and Malaysia. 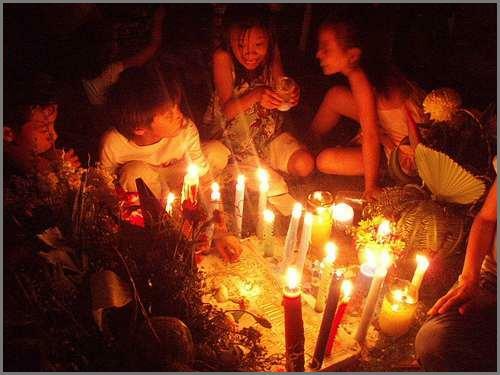 Translating to “Soul-ing,” this rural Filipino holiday shares certain similarities with American Halloween. Children dress in the guise of the dead and go house to house offering a song about the souls in Purgatory in exchange for abúloy (alms for the deceased). Sometimes the children are also given súman (rice cakes). Mischief, an ever-present connotation with these types of traditions, occurs in the form of small items mysteriously disappearing, only to be found the next morning in the yard or street. This symbolizes the belief that ghosts return to their families and make their presence known by taking these items. “Fortnight of the Ancestors” is a 16-day period when Hindus pay homage to their ancestors, through food offerings and the death rite Śrāddha. 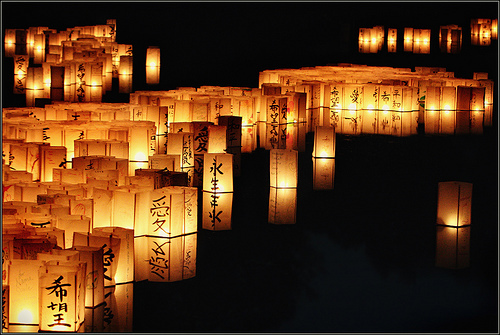 The festival takes place during the autumnal equinox, starting on the full moon day. According to Hindu mythology, there is a place between heaven and earth called Pitru-loka, which is ruled over by the god of death, Yama. This is where the souls of the three preceding generations of one’s family reside before they are able to move on to heaven. It is these three generations of spirits for whom the Śrāddha rite is performed, so that the spirits may leave Pitru-loka and stay in their descendants’ homes for a month until the next full moon. Also called “Night of the Vampires,” this night before St. Andrew’s Day is rife with superstition thanks, at least in part, to Bram Stoker’s iconic Dracula. 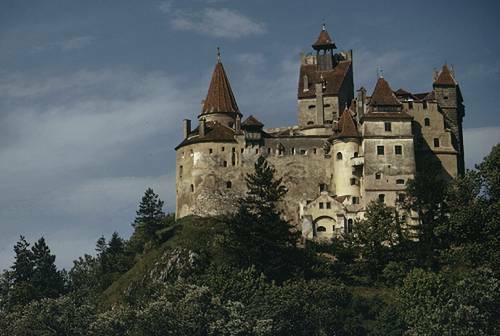 The vampire’s real-life counterpart, Vlad the Impaler, lived in what is now Romania and his castle remains, now the site of some epic Halloween parties. Ideas of vampires, however, reach back farther than Stoker’s fictional depiction of them. During the night of St. Andrew’s, it is believed that vampires and “strigoi” (the undead) come out to dance at crossroads. Some villages participate in a tradition called “guarding the garlic,” which is an all-night party involving a pot of garlic to keep them safe from the rising undead. 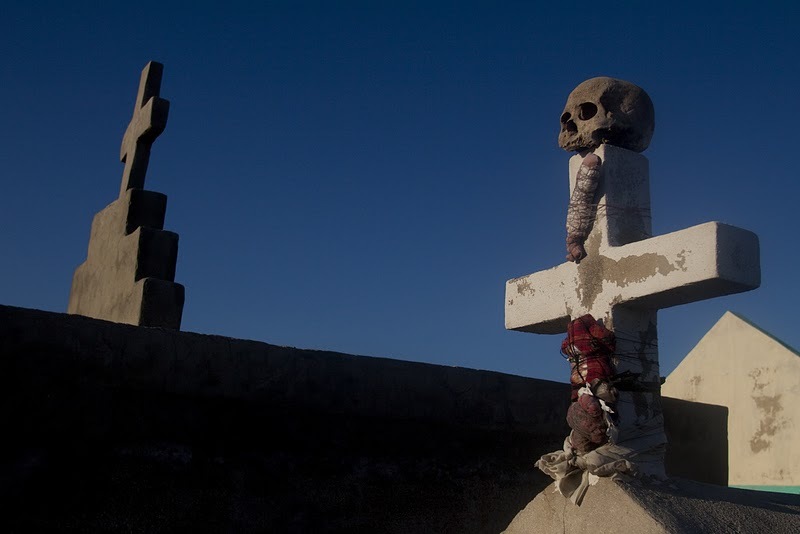 Similar to the Hispanic version of Day of the Dead, Haiti’s Voodoo-inspired celebration centers around the Ghede spirits, who rule the underworld. Altars are filled with offerings of food, cigarettes, rum, and clothing for the Ghedes. As with other versions of the Day of the Dead, this festival is a time for communicating with spirits of the deceased and dissolving the barrier between this world and the next. Often there are Voodoo rituals performed in accordance with the holiday. Celebrated exactly six months from Halloween (at the end of April), Walpurgisnacht is the night when witches are said to meet on the top of Brocken Mountain for the coming of spring. Also called “The Witches’ Sabbath,” this holiday involves bonfires, singing, and dancing. In other countries, there is a carnival-like atmosphere that may seem to Americans like a blend of Mardis Gras and Halloween. Similar versions of the holiday are held in Sweden, Finland, and Estonia. 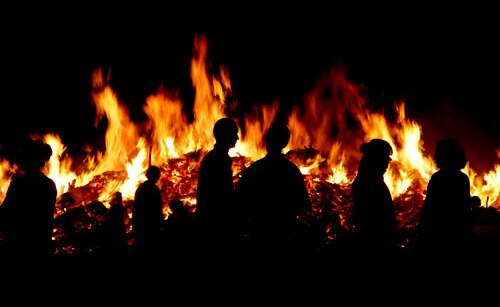 In the Czech Republic, they celebrate the burning of the witches, a symbolic act that brings winter to an end. Halloween may be a largely American (and also Canadian, English, and Irish) affair, but it comes from a long tradition of festivals surrounding the return of the dead to the world of the living: something that is celebrated in various incarnations across the globe. Though now the holiday is highly commercialized and often seemingly superficial, let’s not forget Halloween’s dark and superstitious roots around the world, for every culture has its own version. Not sure where to hop next? Check out Axel Howerton’s Coffin Hop Art Show! How fun! A Coffin Hop teaching me something! This I like! Must tweet you now. Thanks, Lori! Fun and informative is my favorite. Happy Coffin Hopping! That was awesome. Loved the research. Thanks! Hope you’re enjoying the Coffin Hop!